Oh friends, long have I waited to make this collection. 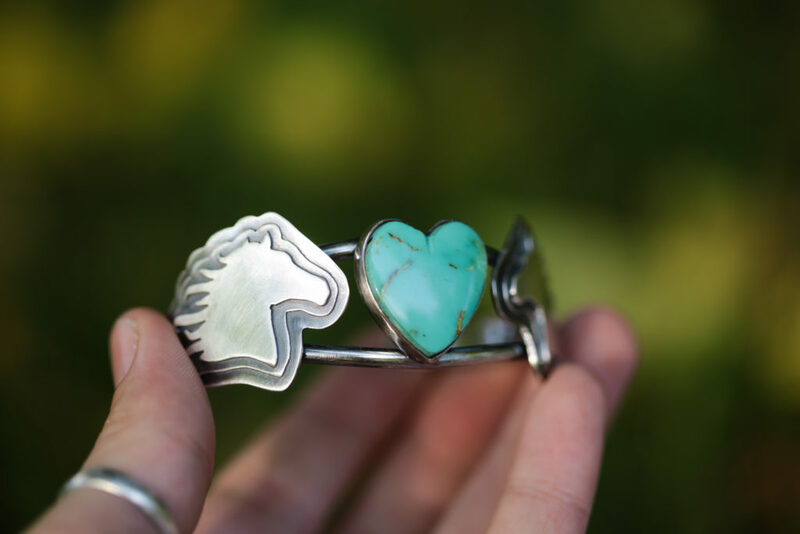 Turquoise is precious to me. It is come by surprisingly rarely in acquisition quests. 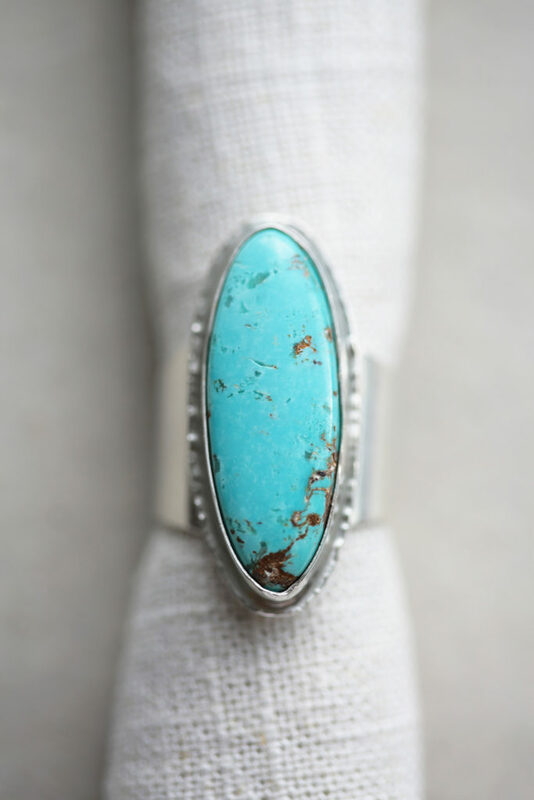 And when I do purchase turquoise, it is one piece at a time. Choosing the colors and shapes that strike the heart individually. 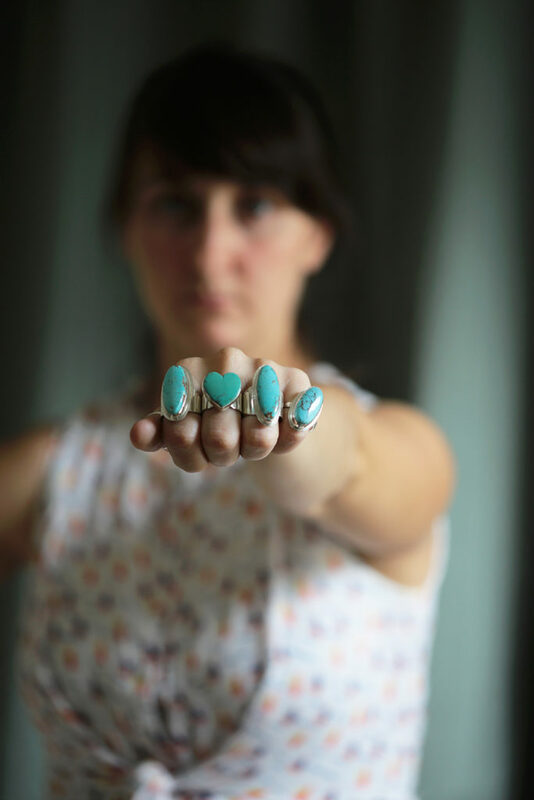 But last month, I decided to pull out my drawer of turquoise and create an entire collection around it. Because for what reason have I been curating and amassing, if not to turn them into pieces of jewelry to adorn the hands, wrists, ears, and necks of you lovelies? And so for several weeks, I have been striking the torch and swinging hammers with generosity in my hands. 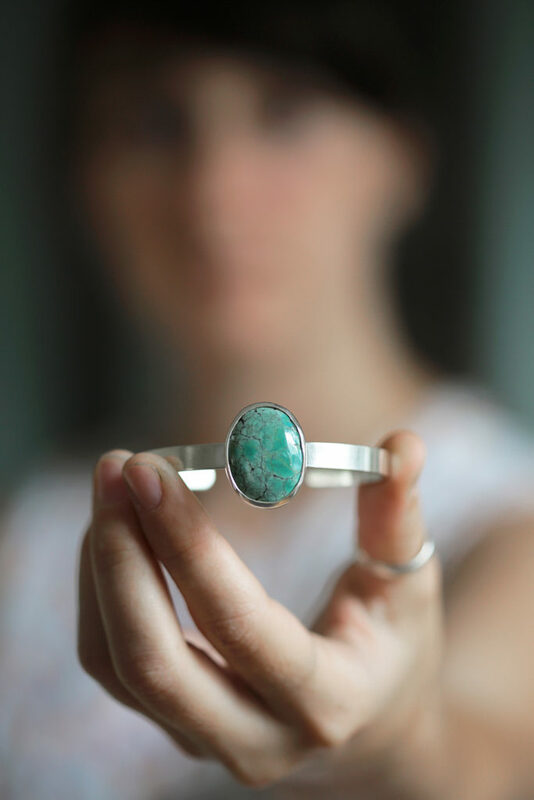 I used every last piece of turquoise I had tucked away in that warm corner of my studio, and turned them into nearly fifty new pieces for the shop. The best part of writing here, is being able to tell you about the genesis of each collection. Describe how aesthetics and ideas patiently waited in the corners for me to notice them, tapping their feet to the rhythm of my studio music until I find the time to walk up and introduce myself. Some ideas are shy and require some time to get acquainted. Others clamor around the periphery until called by name and hurriedly transferred to the sketchbook. This collection was like the former. It began with an afternoon in the arboretum with the fella. He was tromping around in the field with his butterfly net and I was sitting under an alder with Crime and Punishment. 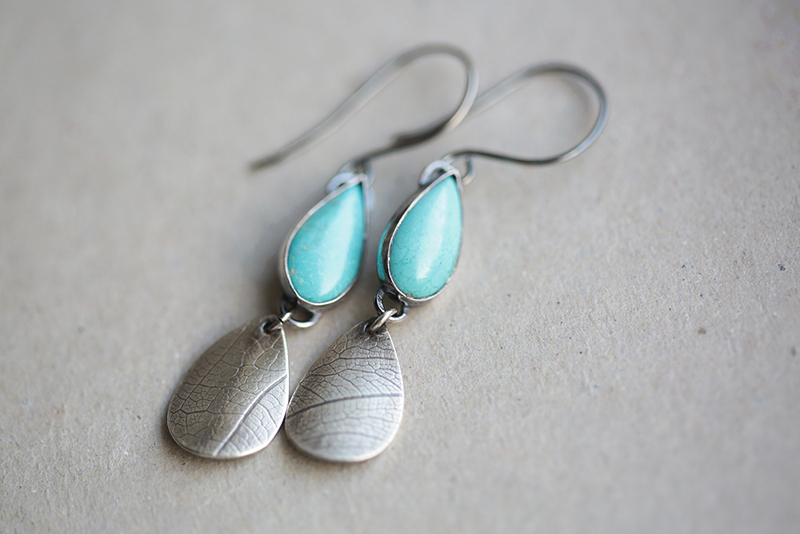 It was on this day in the arboretum when I decided I would make a turquoise collection. I was watching the fella wade through the sun-drenched timothy grass and milkweed and thought of the hands that shaped this particular land. Considered the walnut trees planted in a quaint row, the sloping field allowed to grow long for the butterflies and insects, the stone wall following a tiny, trickling creek. While pushing through the long stalks of burnt grass to join the fella, hearing the cicadas hum in the noon-heat, I thought of those people of the land, particularly the women. All the generations of work-hardened women rising and setting with the sun, pushing and shaping the land alongside their brethren. With that rediscovery of a poem this collection crystallized. I do not know what kind of ornamentation those hands would have had, perhaps it would have been too impractical or considered frivolous. 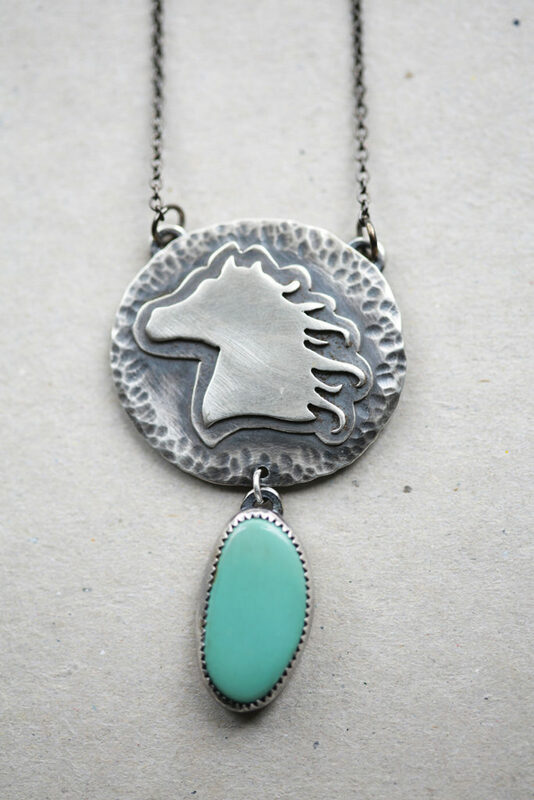 But I like to imagine it would have been turquoise. Saturated teals, blues, and greens against deeply tanned hands and arms. 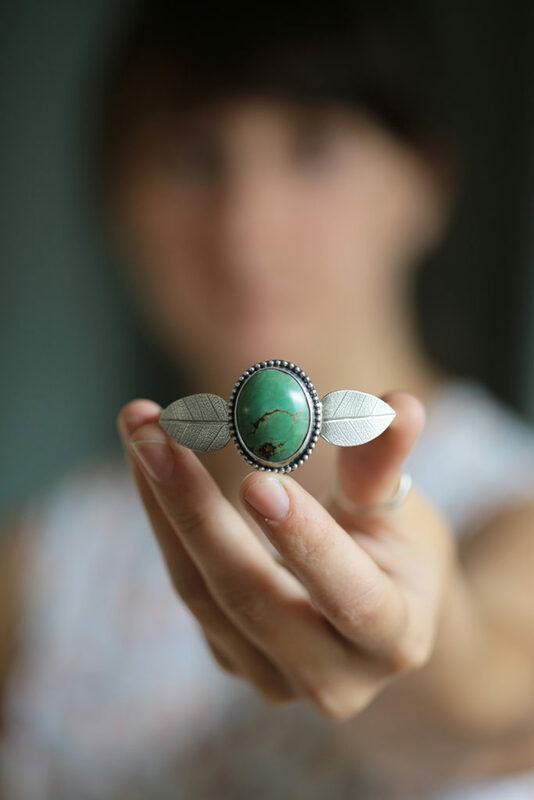 Turquoise, dug out of that same earth from which these people gleaned homes and sustenance, worn by the women who had conquered that very land. 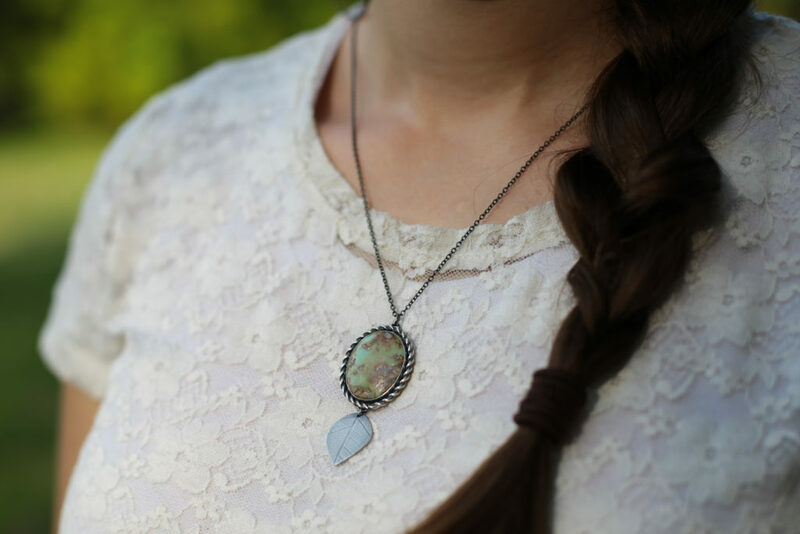 And so I created a collection of turquoise pieces for those “larks over the plowed fields” and those young women “flaming like wild roses” amidst the hardship of rural life. 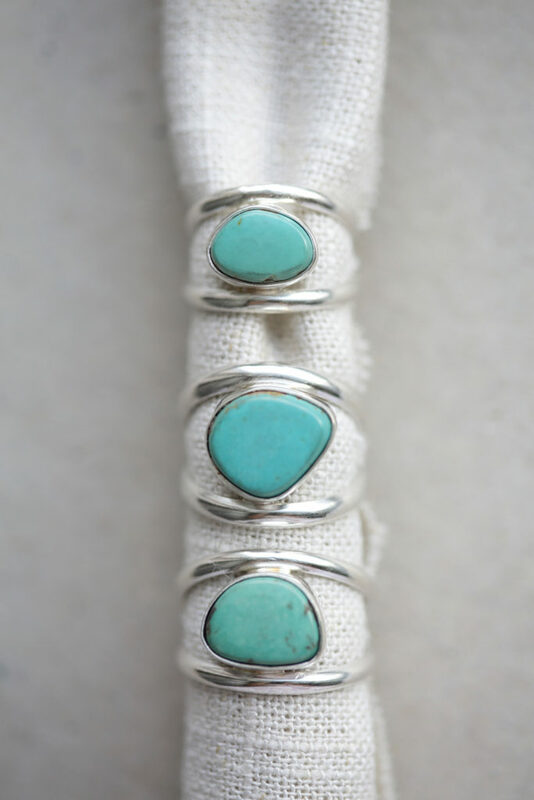 I laid out each of my turquoise stones, taking note of which mines they were from, turning them over in my hands and asking each one what they were meant to be. 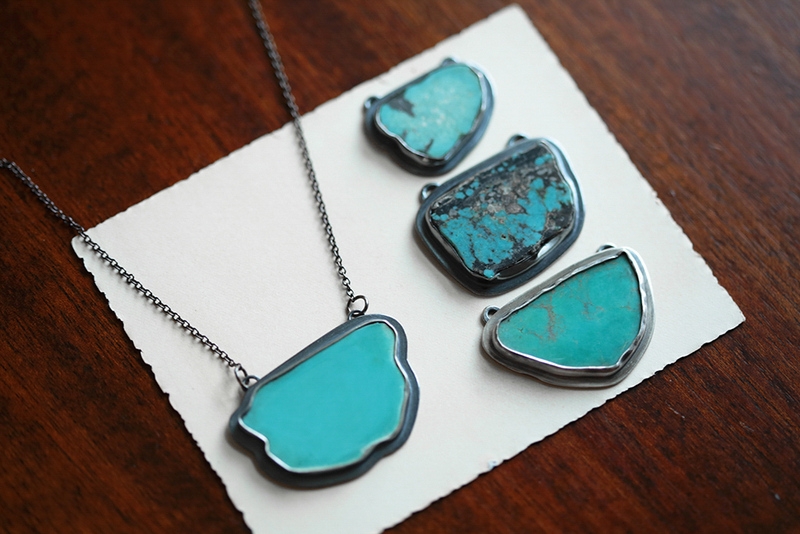 The stones in these necklaces belonged to a mid-western turquoise gemcutter who was unable to finish cutting these stones into cabochons before he passed away. The stones made their way to me, and now his last work is immortalized in these pendants in their unfinished state. 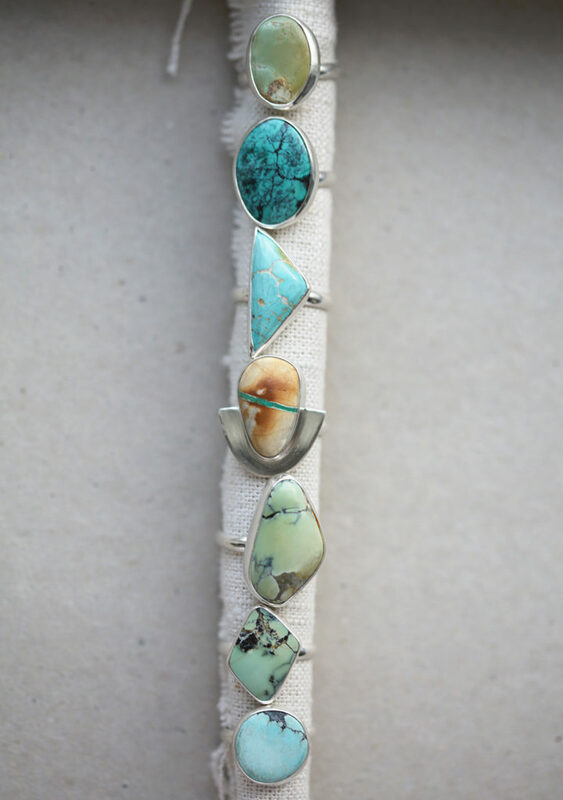 Freeform and beautiful, like little pools of turquoise. 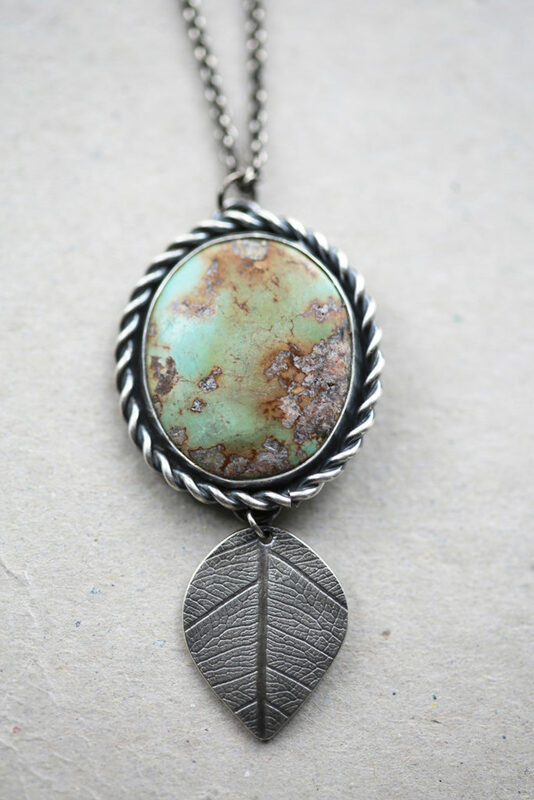 The pendants have been oxidized and then polished to give it a dark sheen, like rain darkened stone. When putting the aesthetic onto paper for this collection, I found barn swallows dipping and gliding at dusk. Horses reveling in the speed and power in their own legs. Mid-summer leaves listless in the heat. 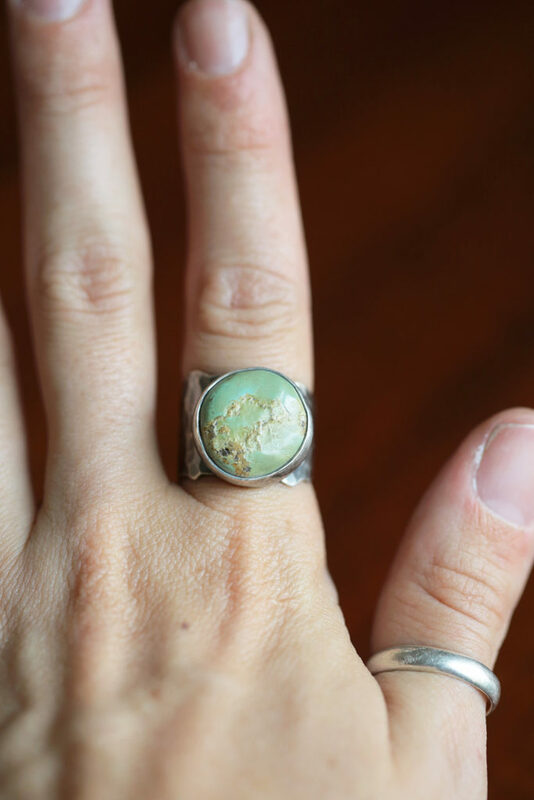 And so with the bite of my jewelers saw and the hot quench of submerged metal, this collection, named The Song of the Lark Collection. There will be bracelets meant for digging into flower beds to retrieve faithful bulbs and reaching through the brambles to get at the last of the summer berries. 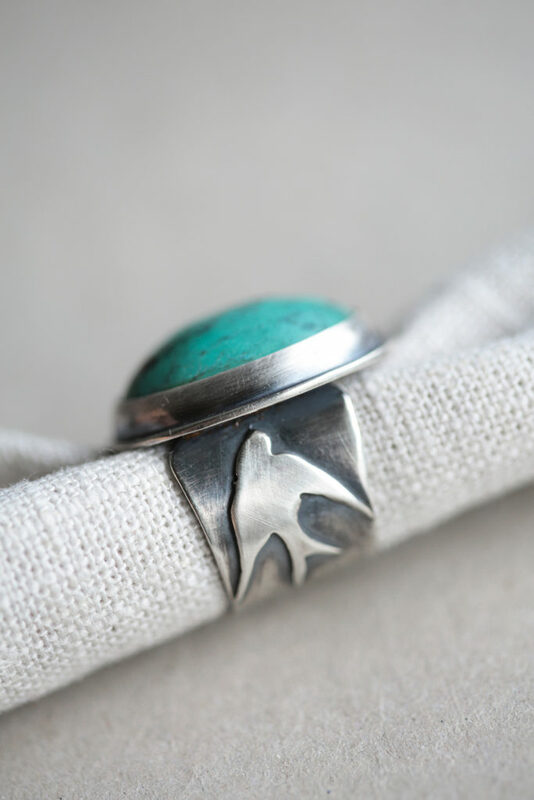 Rings that will sit securely on fingers, meant for resting hands on velvety muzzles and closing barn doors in the evening. 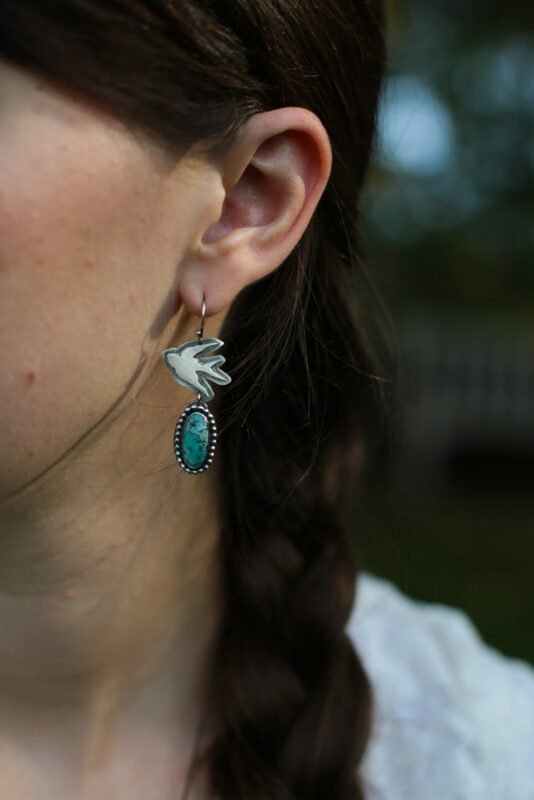 Earrings to sway amongst wind-tousled braids. And necklaces to rest against chests thumping in time with the land. on Saturday, September 23rd at 5:00 p.m. EST. 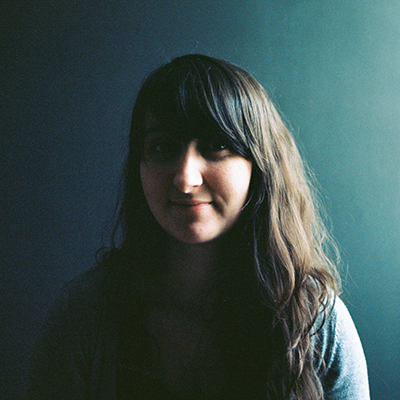 Listening – to a playlist of surf pop and shoe gaze music my fella put together for my birthday four or five years ago. He carefully chose each song, arranged them in just such a way for the perfect flow, and then made me a beautiful astronomy book which he spray painted with shimmering pink and blue constellations. Inside the book he hollowed out a place for the mixtape. He named the playlist “I Love You to the Horsehead Nebula and Back.” Oh my, this fella. Watching – Stranger Things. Again. And again. And again. The new season will be arriving in about a month, and I am crossing every finger and toe that it will be fantastic. Just thinking about it makes me want to restart season one and throw myself into my Halloween collection. Reading – Anne of Windy Poplars by Lucy Maud Montgomery. I am very slowly doling out the Anne books to myself. I read Anne of Green Gables as a little girl, and didn’t realize there was a whole series of them until I was an adult. I could have gobbled them up in one bite, but after learning of their existence, the thought of not having another Anne book on the horizon was unbearable! And so I allow myself to read another installment every five years or so. Appreciating – friendships with like-minded people. These people who are generous of soul, constructed of the best sort of fiber, and share a warmth and vibrancy of spirit. My people. 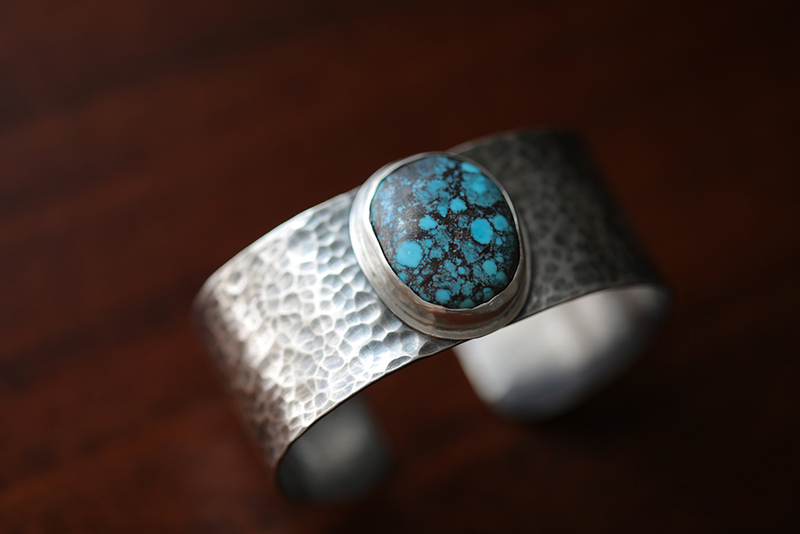 Inspired by – gemstones, in all their spectacular colors, unusual formations, and seemingly impossible locations. Beauty born of twisting, melting, cracking, and grinding. Always inspired by stones. Always.